I will be teaching a two-day SketchUp class on March 18 & 19, 2017, at the Golden Lamb Inn in Lebanon, Ohio. This two-day class (Saturday and Sunday) will cover how to use SketchUp to design, plan and problem solve any project. 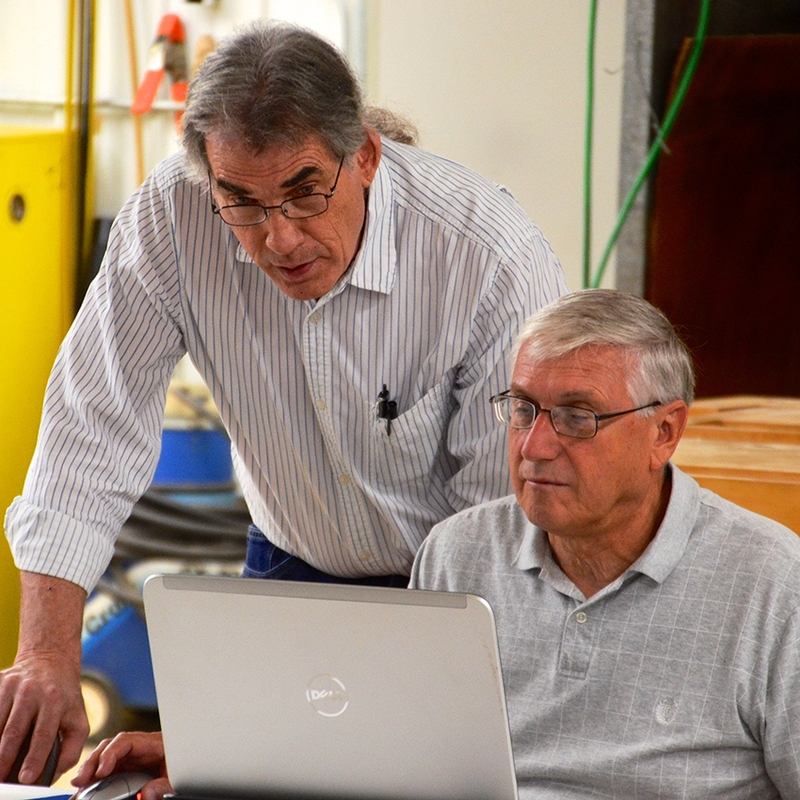 We’ll start with the basics on Saturday morning and by Sunday afternoon you’ll know how to create a 3D model, print drawings or renderings, and generate valuable information about your project. Whatever your end use of SketchUp may be, this class will give a solid foundation. If you’ve been frustrated by trying to learn SketchUp on your own, you will overcome the common hurdles most SketchUp users face. You still need to practice, but you’ll know what to practice to become an efficient 3D modeler.You’ll learn the techniques I use (along with a bunch of tricks to speed things up and ensure an accurate model). In class my computer is hooked up to a big screen so you can see what is supposed to happen. You’ll learn how to create objects in SketchUp and you’ll learn how to move, copy and do just about anything to those objects efficiently and painlessly. One student in a recent class said “I learned more in the first two hours than I learned in the last two years trying this on my own.” I demonstrate techniques then look over shoulders and coach as students practice. That’s the big advantage; I’m there to spot the thing that’s keeping you from moving forward and show you how to get past that hurdle. Though out the class students pick my brain about the different ways to use SketchUp. It’s a great way to learn and we have a lot of fun along the way. WHAT YOU NEED: In a typical class we have people with a wide range of experience with SketchUp. Experience in SketchUp isn’t necessary, but you should be familiar with basic computer operations. Bring your own laptop, (or desktop computer). Make sure you have a three-button, scroll wheel mouse. If you work on a laptop, you’ll find the touchpad nearly useless. If you have a Mac, you’ll struggle if you try to use your Mighty or Magic mouse. Screen size matters! If you have a laptop with a small screen (14″ or less), you will find it difficult to work in SketchUp. Download and install SketchUp directly from the SketchUp website. It doesn’t hurt if you play around with it some before class or if you have SketchUp experience. There are some good video tutorials on the SketchUp website and here on ReadWatchDo. Please note: when you download the program, it begins with a 30-day trial of SketchUp Pro. After the trial period ends, it will revert to the free version, SketchUp Make. The techniques shown in class will be possible with SketchUp Make, and we’ll discuss the differences between Make and Pro. (This post discusses the two versions of SketchUp). Feel free to bring along a notebook. I provide several handouts during class and for this class continental breakfast and lunch are included both days. The Golden Lamb is located in Lebanon, Ohio, just a few miles north of Cincinnati and easily reached from Interstate 71 or Interstate 75. We will be meeting in an upstairs private dining room in this historic hotel. 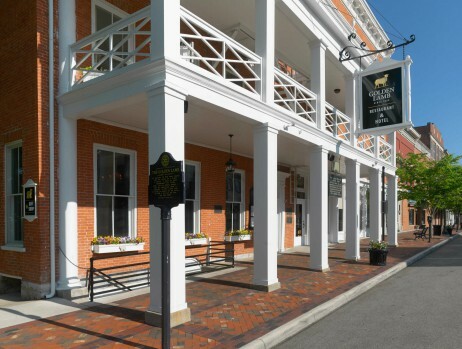 In business since 1803, the Golden Lamb is a landmark in Southwestern Ohio offering great food and a collection of Shaker and other great antique furniture throughout the hotel. Continental breakfast (fruit, juice, muffins and coffee) and Lunch (from the menu) are included in the fees for this class. Please Note: due to the historic nature of the building there is no elevator to the second floor where we will meet. Lebanon is about halfway between Cincinnati and Dayton. The Dayton airport is easier to get in and out of than the Cincinnati/Northern Kentucky airport, and flights to and from Dayton can cost considerably less. Lodging is available at the Golden Lamb. Click here to make a reservation directly from the hotel. Other hotels are also available a few exits South on Interstate 71, near Kings Island. We need a minimum of 6 people to hold the class. UPDATE: MARCH 4, 2017 – THIS CLASS WILL BE HELD. AS OF TODAY, THERE ARE STILL A FEW SPOTS AVAILABLE. I’ve set a deadline of March 5, 2017. If fewer than 6 are signed up by that date, the class will be cancelled and all payments made will be refunded in full. At the other end of the spectrum, the upper limit for this class is 12. If we reach that limit, we’ll establish a wait list and let you know if space becomes available. The fee to take this two-day class is $300. All payments will be made directly to me, Bob Lang through this website. After you register you will receive a confirmation of your payment through PayPal. If you have a balance due you will receive an invoice for the balance. If I cancel this class, all payments will be refunded in full. If you have any questions, send me an e-mail by clicking on my signature below. How about making this available on computer to us who are far removed from the class sight? Thinking about it . . .